The long-gestating, often-delayed sequel to 2012's Wreck-It Ralph, Ralph Breaks the Internet is one part fan service, one part product placement, and one part pop culture inundation. It's breezy and fun and, like its predecessor, relies more for its appeal on nostalgia and familiarity than a strong narrative thrust. The movie offers a professionally-made, officially sanctioned mashup of genres and characters the likes of which has only previously been possible in fan-crafted YouTube videos. Although story may be Ralph Breaks the Internet's weak point, it's sufficient to tie everything together and provide a reason for the film's many small pleasures to exist. Six years after the end of Wreck-It Ralph, Ralph (voice of John C. Reilly) and Vanellope (voice of Sarah Silverman) still find themselves comfortably ensconced in their game consoles at Litwak's arcade - Ralph as the villain in Fix-It Felix and Vanellope as the star racer in Sugar Rush. For Ralph, this is the perfect life; he enjoys repetition and predictability. The sameness of everything is grating on Vanellope, however. Like all Disney Princesses, she craves adventure in the great wide somewhere. She's about to get her wish. When Sugar Rush is damaged and Mr. Litwak (voice of Ed O'Neill) can't get a replacement part at a reasonable price, he decides to sell the console for scrap, making Vanellope and dozens of other avatars "gameless." To forestall this, Ralph and Vanellope make a dangerous, pioneering trek into the "Internet" using a newly attached port called "Wifi." Their journey includes a visit to a search bar (where the all-knowing bartender attempts to guess Ralph's requests before he finishes speaking them), a stop-off at an online racing game, an excursion into the seedy bowels of the Dark Web, and a vacation at a website that specializes in all things Disney (and Marvel, Pixar, and Star Wars). Ralph and Venellope find the part they need on eBay but, in order to pay for it, the need money. So Ralph makes a series of videos (including one in which he imitates painter Bob Ross) that go viral. The more she sees of the Internet, however, the less satisfied Vanellope becomes about the thought of returning "home." The central themes of Ralph Breaks the Internet are traditional animated staples: learning about the real meaning of friendship and how it requires sacrifice. If this sounds a little obvious and derivative, consider that Ralph Breaks the Internet is more about style and bling than substance. And there is imagination in evidence - just not in the film's storyline or messaging. The way the Internet is structured and presented - like a huge city where every website is a building and each user is represented by a digital embodiment of themself - shows creativity. 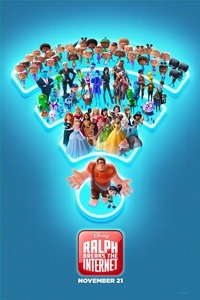 Taking cues from the virtual world of The Emoji Movie and the micro-universe of Inside Out, Ralph Breaks the Internet crafts a reality in which the complexity of computers and telecommunications are laid out in a fashion that anyone, even children, can relate to. In an unusual move for a Disney film, there's no true villain. Although there's a threat, it results not from an external nemesis but Ralph's insecurities. This facilitates an action-oriented climax without demanding the traditional conflict one expects from an animated film. Ralph Breaks the Internet introduces several new characters - most notably the tough car racer Shank (voice of Gal Gadot) and the entity Yesss (voice of Taraji P. Henson), who promotes viral content across a variety of social media platforms. The most fun sequences (and those guaranteed to generate the most discussion) take place inside the virtual Disneyland. Within this website can be found all the Disney properties and many are accorded cameos. Marvel is represented by Iron Man, Groot, and Stan "the Man" Lee (who appears fleetingly in what real-world events have turned into a tribute). Pixar's ambassadors are Buzz Lightyear (voice of Tim Allen) and Princess Merida (voice of Kelly Macdonald). Star Wars provides stormtroopers and a frazzled C-3PO (voice of Anthony Daniels). But by far the most entertaining inhabitants are the Disney Princesses - a variety of plucky damsels culled from decades of animated films, many of whom are voiced by the actresses who spoke for them in their original outings. (Jodi Benson's Ariel even gets to exercise her musical pipes, albeit briefly.) They provide Vanellope with "princess advice." This includes the importance of having a song to sing from the heart. When she gets one, it is (of course) provided by Alan Menken. It's possible to complain that this smacks too much of consumerism and self-promotion but the intent of these sequences seems fun-loving and lighthearted. Surely it's worth a smile to see 3-CPO interacting with Belle and Snow White? Given the opportunity to do this, everyone got on board including eleven returning actresses (plus a few new ones for the older princesses) and the animators who meticulously recreated the appearances of the characters. This isn't something I'd like to see done often but, considering that the circumstances allow it in this case, its inclusion gives Ralph Breaks the Internet a must-see element. Considering the incestuous relationship that exists between Pixar and Disney Animation, it's easy to forget that they remain separate entities. Sophistication is one dividing line - the Disney films tend to be thematically lighter than the Pixar ones - a characteristic that's evident here. Pixar's approach to childhood memories and nostalgia resulted in the emotionally powerful Toy Story 3. With Ralph Breaks the Internet, there's some superficial overlap but few adults will be moved to tears by what this film offers. Instead, it's a great valentine to old-time video games, the Internet, and Disney. The animation is bright, busy, and eye-catching. It's a great holiday present and, as with many presents, the packaging is at least as important as what's inside.